← Trump grabs media watchdogs by the scruff! Is the media exercising their 1st Amendment rights to “speak truth to power,” or are they just a bunch of hate-filled Democrat propagandists? Does The Donald’s calling them out on lying constitute restricting the freedom of the press? Republican Senator John McCain, long known as a RINO, once again speaks up to defend the leftwing Democrat media. Following President Trump’s chastising them for the hateful reporting the Democrats went to their cameras and slandered Trump just as he said they would. McCain coming to their defense is another example of his true colors. Of course he goes to CNN, the new home of fake news, to speak with his forked tongue and spew his poison. This is just pure stupidity that anyone believes they can smear Trump but should be immune from being condemned for their lies. The relationship between the President and the press corps is not the same as a leftist’s relationship with his wife where he gets to beat her and she has to say she deserved it. Journalism is supposed to report the facts and tell the truth, not be free to make up sh*t as they go. Fake news doesn’t come from the Internet bloggers, but from the Mainstream Media. All interaction is a two-way street, and the people who are supposed to be the watchdogs of those in power are instead being the attack dogs of those who are out of power. President Trump, as do we all, has the perfect right to slap them down when they lie and twist the truth to fit the propaganda of their Democrat masters. President George W. Bush allowed the media to lie about him for eight years and spread all the lies they wanted. The result was the election of Barack Hussein Obama, a racist America hating Moslem, to the office of Leader of the Free World where he used that power to bring down America and revive the Jihad. The press’ freedom isn’t being restricted. They are calling Trump Hitler and the restriction of Moslem immigration into America the new Holocaust. The people who deny that the Jews were exterminated in concentration camps are saying that keeping Moslems from immigrating to America, where all they want to do is impose Sharia on the land of the free and make white people their slaves, is the same as putting them into gas chambers. This is nothing less than delusional, and nothing more than treachery. The free press is NOT free to lie and propagandize as they please. I stopped listening to their opinionated reporting when I turned 30 and realized how they warped the truth. Those who speak with two-faces have every right to talk, but they DO NOT have a right to force us to believe them! Trump grabs media watchdogs by the scruff! Enough of these nasty political hacks! How about some good old American Christian truth and love that everyone can enjoy? Impeach Trump! Now. Now! NOW! This entry was posted in Fundamentals, Politics and tagged 1st Amendment, Democrat propaganda, Donald Trump, Fake News, Free Press, John McCain, Leftwing media, Liberal protests, Mainstream Media, Media lies, Trump's war with media. Bookmark the permalink. One of President’s stated goals is to destroy MSM and IMO he will go away when he does. Until then, he’s going to be around. They can try to character assassinate him and it will not work. Some of his supporters may be thin-skinned, although their next failure will be the inability to divide them. MSM added Alex Jones on the list of people to slander. The President may be restrained from filing a libel suit (being a noteworthy public figure), but Alex Jones is not and my warning to MSM back off because Jones is free to sue. I wouldn’t put it past him to do something like that. Another person they are slandering is Mike Adams (NaturalNews.com and NewsTarget.com) – and he’s gone on the record that he will fight back to the point of engaging the FBI. Until Donald Trump came along the press had me believing all of America thought their way. Talk Radio had their selected listeners but Trump was able to single out the ‘lying media’ on a national scale. 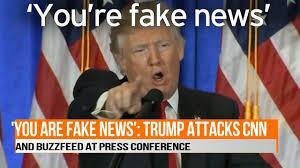 Now everyone was able to hear the message and truth about the media ‘fake news’. With president Trump, my faith is restored that there is great hope for America once again. Common sense may still overshadow political correctness. I pray for the safety of the Trump family and administration. OMG!!! You are brainwashed. I can pray for you too. To sit so blissfully in you ignorance to refuse to witness the corruption that went on to get into office but after he got into office. How many of his administration have been convicted, already? How many Russians have been charged? Why do you refuse to see the correlation? Are you, too, over glyphosated? You need to wake up to the fact that our country has been run by fake news since Trump has been in office. He does what Fox News wants him to do. He listens to them, not his advisors. I can only imagine that you’re afraid of women and children, also. When are you going to admit that the REAL propaganda is coming from y0u and Trump, from whom you learned it. Trump learned it from Russia meaning you just bought Russian technology. Congratulations! You’ve been Trumped by a Drumpf. Still believing the “Russians did it” thing? A lie dreamed up by the Shillary campaign to explain her massive loss and the Wikileaks expose’ of her staffs emails. Not to mention her use of an unsecured server for classified materials, approving the sale of 20% of our uranium stock to a Russian company, etc. The list goes on from there. You are truly a fool and, probably, incapable of independent thought or learning. Poor sheeple. Yet, you chose to ignore evidence. I examine facts. When will you start to? Everything I see on this site is nothing but propaganda. Is this what you’re talking about when you say “Fake News”? The first thing of note that is fake is your name. And using the “you lie about everything” without citing a single example or producing one iota of proof is the elementary nonsense of vacuous liberal thought. Dusty, you have arrived, attracted the attention of the empty headed sheeple of the left. As usual, they cite nothing to back up their charges and still cling to the MSM as their bible of what is the truth. Facts? Nah, they don’t need no stinkin’ facts, they have the MSM to back them up. Fools, all of them. Good work, Dusty, keep it up. Don’t you mean the backwards conservative thinking? You rely on fer to guide your lives. Evil works through fear. When you learn that, you’ll wake up, just like I did. It took me 40 years to wake up out of my ignorance and see that it was driven by fear and anger with no trust anywhere. When I look back on that now, I remember a troubled and often violent life that I no longer wish to live. My hope for you is that you’ll wake up to see the same thing. (giving up the carbs and beer helps) Go keto and get really healthy to live for the next 100 years. You’re rambling because you fear the truth. Who really fears the truth, Dusty? Me, or YOU? I’m not the one believing life on planet Earth is going to end because of mankind’s pollution. You can’t come up with facts to back your assertions because all the facts point to Democrats being dupes. All you can do is try to slander and demean those who reveal the truth. Those are the defenses of liars and fools who fear being discovered. what did you eat for breakfast? who do you worship? who do you fear? Do you fear God? What did you have for breakfast? Are you hungry, yet? What do you worship? Your hunger? Or, your greed? What do you fear? Do you worship, what you fear? what did you eat for breakfast? How hungry are you, yet? Do you believe in the Apocalypse? Are you waiting for it to happen? Are you trying to encourage it to happen? What are you trying to incite? Don’t you recognize criminality? Do you appreciate this man, stealing your money? I sure as hell, don’t appreciate him stealing mine. And don’t understand, why you do! Only liars fear the facts. I’ve over 150 posts of facts that you appear to be deathly afraid of, to protect a hidden idea of trump prosperity which you’ll soon learn, is all for him. Look at what’s he’s pilfering off of his office violating the emoluments clause with all the Saudis and Russians owning so many of his properties. I warned you 3 years ago this would happen. But, you chose to ignore that due to your fear of discovering that your “savior” is really a false prophet, foretold about over a dozen times in the old and new testaments, who is nothing more than a bully that actually lost the ’16 election, by a popular vote of 3,000,000 voters. That’s 3,000,000 that don’t approve of what he’s doing and shun his behavior and policies that are deepening our debt. If you can’t see that, you truly are blind to the bliss of ignorance. That’s alright, though, I can still pray for you. (Even though you don’t, yourself.) That’s the facts, and that’s the rest of the story. You should read my articles regarding the Electoral College to educate yourself. I tried to read your first page on your site, but couldn’t get past the hypocrisy of your tale about spending money we don’t have, To me, it was so full of ignorance that you really are blind. Why are 15,000,000 troop going to the southern border to protect us from fleeing women and children looking for asylum? Your site starts off with deceptive propaganda. Do you think really that gives you the right say anything? It may, but It doesn’t give you, the important ability, to be right, making you part of the fake news. To be right, you have to be educated on the facts. Case closed. The fact that you think we have 15,000,000 troops going to the Mexican border to stop an invasion of men (that you call a “refugee crisis of women and children”) is proof you can’t understand simple math. So it’s no wonder you can’t understand the truth and parrot “fake news” as if you know what’s fake. When you can’t add in math that is always an exact truth you can’t comprehend facts. Get an education before you try to tell others what is true.